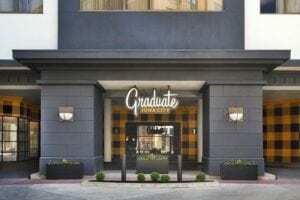 Here at Graduate, we believe life is a timeless journey filled with memory-making stops, extraordinary rites of passage and all of the courageous leaps of faith that get you where you’re going. Welcome to Graduate Iowa City—where your intellectual curiosity meets your favorite place to stay. Located in heart of downtown Iowa City, we’re proudly perched on the Ped Mall, just a few blocks from campus and across the river from Kinnick Stadium. We’re your home team for Hawkeye games or a downtown caucus.